A campaign has been launched against selection in secondary schools in England. 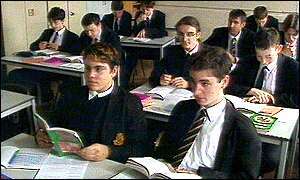 The Campaign for State Education (Case) says selection has increased in recent years but could be ended. The drive has been backed by the former Labour deputy leader Roy Hattersley. At a meeting in London, he called on parents to end what he called "educational apartheid." "Almost all the failures are schools which are comprehensive in name only," said Mr Hattersley. "These are schools denied the stimulus of talented pupils because talented pupils have been creamed off by the local grammar school. "And then those grammar schools have the gall to say that their results are better than local comprehensive schools," he said. There are 161 grammar schools in England, accounting for just over 4% of secondary pupils, and in some areas schools which were comprehensive have become partially selective. Case makes the point that all state secondary schools in Scotland and in Wales are comprehensive - although it makes no mention of Northern Ireland's entirely selective system. It is alerting people to the School Standards and Framework Act, which allows every school to become partially selective by selecting 10% on "aptitude" if the governing body is satisfied the school has a specialism - but also allows for local ballots to end selection. Regulations laid before Parliament for approval this week set out the details of how these ballots will work. In some local education authorities all parents would be able to vote in whole area ballots - areas such as Buckinghamshire, which has the best GCSE results in the country, and Kent, which does less well than neighbouring comprehensive school authorities. A ballot would be triggered by a petition signed by 20% of parents at all local schools. But where grammar schools are less common, those entitled to vote would be the parents of children at feeder schools - defined as those which had sent at least five pupils over the last three years to the grammar schools. Case complains that this 'feeder' ruling might disqualify parents at local primary schools which do not send many children to a grammar school, but give a vote to parents of independent prep schools some distance away which do routinely send pupils there. Eric Spear: "Selection is unfair"
In Kent, pupils doing mock 11-plus exams at Staplehurst Primary School are nervous about the real thing - which most of them will fail. The headteacher, Eric Spear, believes that children who do not get to grammar school lose out. "Look at the rest of about 95% of the country that doesn't have grammar schools," he says, "and look at the rest of Europe which by all accounts is doing so much better than we are in all sorts of fields, they don't have them either." Neil Turrell: "It could almost be death by a thousand cuts"
The head of Maidstone Grammar, Neil Turrell, is worried by the potential distraction of ballots against schools such as his. "I don't sense a great movement in Kent obviously to damage successful schools," says. "But if it is there, then quite clearly this is something that can come around again and again and again. "It will divert people like me from doing what we should be doing which is concentrating on the education of our students."